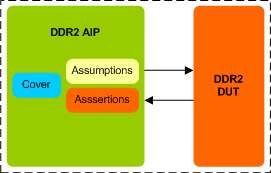 DDR2 Assertion IP provides an efficient and smart way to verify the DDR2 designs quickly without a testbench. The SmartDV's DDR2 Assertion IP is fully compliant with standard DDR2 Specifications and provides the following features. Supports all DDR2 data widths and address widths. Supports all DDR2 bank address widths. Supports all DDR2 burst lengths. Supports all DDR2 CAS latency. Supports all DDR2 auto precharge for each burst. Supports extended mode register command. Supports mode register set command. Support for Read/Write Command rules etc. Support for all timing violations. Support Master mode, Slave mode, Monitor mode and Constraint mode. Supports Simulation mode (stimulus from SmartDV DDR2 VIP) and Formal mode (stimulus from Formal tool). Rich set of parameters to configure DDR2 AIP functionality. Runs in every major formal and simulation environment. SmartDV's DDR2 Assertion env contains following. Detailed documentation of AIP usage.